Do you find yourself putting a lot of information in your “Order Notes” or using outside software, such as Excel, to keep track of order details? Say goodbye to all of the hassle of keeping track of order information in a million different places! The Admin Custom Order Fields extension will allow your team to use WooCommerce as a complete Customer Relationship Management system so order information is centralized where the orders actually happen — right within your WooCommerce dashboard. All order details, notes, fields, and information addition can be streamlined right within the order itself, allowing you to standardize order details, keep all order information in WooCommerce and not scattered across multiple systems, and sort or filter ordersbased on your custom order information. Keep all of your order details where they belong: tied to the original order! Let’s say that you’re using WooCommerce to book helicopter tours, and you need a way to assign times, pilots, or other details to an order. Admin Custom Order Fieldsallows you to add these details from the Orders Dashboard, and even optionally display them to the customer on the “My Orders” page. Using WooCommerce to sell other services? You can add dates for coaching sessions, assign multiple case managers to a consulting account, or manage any other order details you wish. Stop jotting down everything in the order notes and start to organize and compartmentalize with Admin Custom Order Fields! What Can Admin Custom Order Fields Do? If you’ve been using order notes to add order details, or even worse, been using an outside system to track order details, you know that it’s a pain to keep all of this information updated, especially if it needs to be shared between team members (don’t worry, we know how it’s tough to use Google Docs for all of this!). Adding all of these details as order fields will simplify record-keeping so that all details are managed right within WooCommerce and visible to all team members. By default, all admin order fields are hidden from customers. Even better, you can sort or filter orders based on these fields. Need to assign customers to a trip or tour group after their order has been placed? Want to let them know who their tour guide or pilot will be? 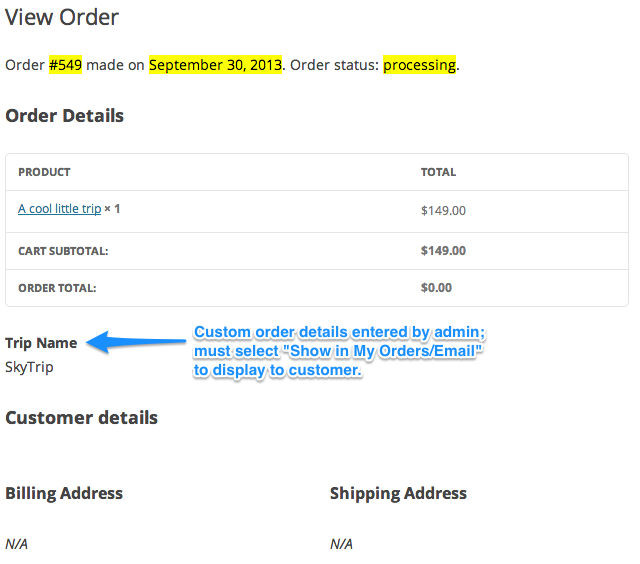 Doing so is easy with Admin Custom Order Fields. Set the order field attribute to “Show in My Orders/Email”, and customers will be able to view that field with the rest of their order details.